Just like the one's you used at school, except these one's are new and super sharp! These low cost wire strippers are excellent for beginners and pro's alike! Spring loaded and adjustable for cable and wire up to 3mm, everyone needs a pair! By fixing the adjustable screw to the desired length (or using the strippers free hand), they can 'strip' the PVC insulation from copper wire for prototyping, breaboarding and any other electronic project you can think of! Pressed Steel Stripper for Cables up to 3mm Diameter. Hardened and tempered sprung steel blades. These 6" Diagonal Cutters are the perfect companion for all your Raspberry Pi projects. Strong, accurate, comfortable and well proportioned for electronics. Excellent for snipping wires and trimming solder - a good 'all-rounder'. 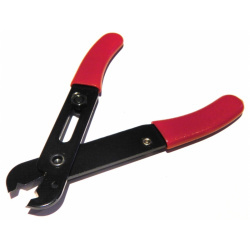 Long Nose Pliers with a Matted (Rubber Feel) handle for a comfortable grip. 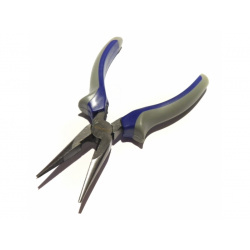 These 6" Long Nose Pliers are an excellent addition to your Raspberry Pi project toolkit. The extra long nose of these pliers is perfect for getting at those little components! Strong, accurate and comfortable with a matted grip - a good 'all-rounder' and excellent for squeezing, bending and shaping anything! Ever felt like you need a third hand when soldering or fiddling with little components? How about two extra mini crocodile-clip hands, with the addition of a magnifying glass, which also looks like a mini robot? Well, we think you'll love this helping hand then! Perfect for gripping PCB's, small components, or even as a nice stand for your Raspberry Pi.